Friends Meeting for Worship is a gathering of individuals who sit quietly together, each seeking a sense of Divine presence and guidance. This reverent silence affords the opportunity for each to quiet the turmoil of thoughts and to center on the search for truth. Some members and attenders of Portland Friends Meeting center on their faith in Jesus, others view the profound insight of the great world religions as mythic and symbolic in nature, and some, in traditional terms, could be considered to be agnostic. Yet group silence enhances each individual’s awareness of being accompanied by others in a common search and a shared openness to Divine guidance. When someone is moved to speak as the Spirit leads, he or she rises and speaks briefly in a manner that all can hear. We allow some time to elapse between messages, so that the full import is not lost. We believe that the messages are inspired by the source of the Light within us and merit our attention. Sometimes it is easy to immerse oneself in the silence, and at other times some of us may be disturbed by distractions outside or by our own unsettled thoughts. On these occasions we return again and again to the still center of our being where we can know the presence of God. We try, if only briefly, to be quiet in body, mind, and spirit. Meeting for Worship is always a high venture of faith, to which we invite you and welcome you. The hour of worship closes when one of the current Co-Clerks shakes the hand of a person close by, and we all share similar greetings. 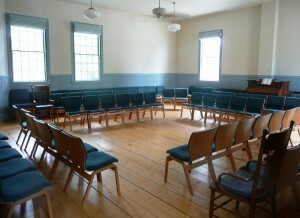 The Co-Clerk will then ask for introductions and there are usually a few announcements, after which we share modest refreshments in the side parlor and enjoy each other’s company. Please see our Meeting Programs page for more information on children and adult programming before and during Meeting for Worship. We meet for worship every Sunday at 10:30 am from September (after Labor Day) through June. The months of July and August we meet for worship every Sunday at 5:00 pm, followed by a potluck meal to which everyone is invited.